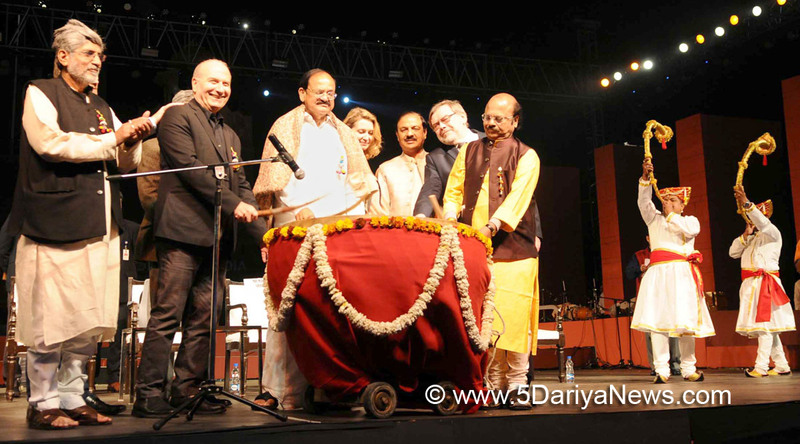 The Vice President of India, M. Venkaiah Naidu has said that all arts, all thoughts must move in one direction to bring in universal brotherhood. He was addressing the gathering after inaugurating the 8th Theatre Olympics and releasing it’s logo titled ‘Flag of Friendship’, here today. The Minister of State for Culture (I/C) and Environment, Forest & Climate Change, Dr. Mahesh Sharma and other dignitaries were present on the occasion.The Vice President said that art and cultural ties have united humanity from time immemorial and ancient civilizations like the Greek, Roman, Babylonian, Egyptian and Indus Valley civilizations have enriched the cultural capital of the world. He further said that art is a mirror of the society and is reflection of the lives of people. It is a creative transformation of the stories of ordinary lives into an extraordinary art form, he added.The Vice President said that art forms touch human hearts like no other impulse and it can produce different aesthetic responses in the viewers. He further said that art can move them to tears, make them laugh heartily, make them feel angry about an issue, make them feel disgusted about some reality. There are a whole lot of emotions it can generate, he added. The Vice President quoted a song composed by the Indian Saint, Paramacharya Chandrashekhara Saraswathi and which echoes the timeless Indian vision of the whole world as one family: “Maithreem Bhajatha Akhila Hrith Jethreem” (Cultivate Friendship and Humility, which will conquer the Hearts of Everyone). This is the message that India has been giving the world for many centuries and it is probably a message that is most relevant in a world that is torn with narrow, fractured vision, he added.The Vice President said that art can help us to sublimate many raw emotions or as the Greek dramatists called it, undergo “catharsis” in which our thoughts get purified. He further said that the Indian tradition also emphasized the need for art to keep in view the impact which should serve the larger objective of “good to humanity” (Vishwashreyahkaavayam).The Vice President welcomed all the artists from around the world and expressed his hope that they will share with each other different facets of their artistic excellence and take away pleasant memories of their stay here. He further complimented the Ministry of Culture, Government of India, and the country’s premier theatre institute, the National School of Drama.